In this article with the help of simple animation, let us discuss how electric car works. Electric cars are making big waves in the automobile world. These noise-free, pollution-free and high-performance vehicles are expected to make their IC engine counterparts obsolete by 2025. 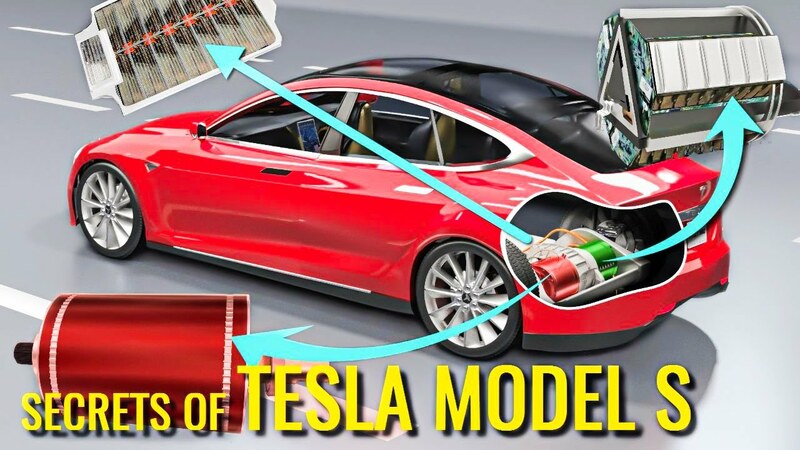 This video will unveil the hidden technologies behind the Tesla model S. Which recently became the world’s fastest accelerating car. We will see how electric cars have achieved superior performance by analyzing the technology behind. The induction motor, inverter, Lithium-Ion battery, Power source, and above all, the synchronized vehicle mechanism. In a logical step-by-step manner. The powerhouse of the Tesla car is an invention made by the great scientist Nikola Tesla around 100 Years back. The induction Motor has two main parts. The stator and the rotor. You can see the construction details of the motor here in the video. The rotor is simply a collection of conducting bars short-circuited by end rings. A three-phase AC power input is given to the stator. The three-phase alternating current in the coils produces a rotating magnetic field. The Tesla motor produces a four-pole magnetic field. This rotating magnetic field that induces current on the rotor bars to make it turn. In an induction motor, the rotor always lags behind the RMF. An induction motor has neither brushes nor a permanent magnet. At the same time, it is robust and sturdy. The beauty of an induction motor is that. Its speed depends on the frequency of the AC power supply. So just by varying the rate of the power supply, we will be able to alter the drive wheel speed. This simple fact makes electric car speed, control easy and reliable. The motor supply is from a variable frequency drive, which in turn controls motor speed. The motor speed can range from zero to 18,000 rpm. This is the most sizable advantage electric cars have when compared to internal combustion cars. An Internal Combustion engine produces usable torque and power output only within a limited speed range. Therefore, directly connecting the engine rotation to the drive wheel is not a smart idea. Transmission must be introduced to vary the drive wheel speed. On the other hand, an induction motor will work efficiently in any speed range. Thus no varying speed transmission is needed for an electric car. Moreover, an IC engine does not produce direct rotational motion. The linear motion of the piston has to be converted to rotational motion. This causes significant problems for mechanical balancing. Not only is the internal combustion engine not self-started like an induction motor further, but the power output of an IC engine is also always uneven. Many accessories are needed to solve these issues. On the other hand, you will have a direct rotational motion and uniform power output with an induction motor. Many components in the IC engine can be avoided here. As a result of these factors, a great response rate and higher power to weight ratio come naturally to an induction motor resulting in superior vehicle performance. But from where does the motor receive power? From a battery pack, the battery produces DC power, so before supply get to a motor, it has to be converted to AC. An inverter is used for this purpose. This power electronic device also controls the Ac power frequency, thus controlling the motor speed. Moreover, the Inverter can even vary the amplitude of the Ac power. Which in turn will control the motor power output. Thus the inverter acts as the brain of the electric car. Now let’s turn our focus to the battery pack. You will be amazed to find that they are just a collection of common lithium-ion cells similar to those used in your daily life. The cells are connected in a combination of series and parallel to produce the power required to run your electric car. Glycol coolant is passed through metallic inner tubes through the gap between the cells. This is one significant innovation of Tesla by using many small cells instead of a few big cells. Effective cooling is guaranteed. This minimizes thermal hot spots, and even temperature distribution is achieved leading to higher battery pack life. The cells are arranged as detachable modules. There are 16 such modules in the battery pack. Constituting around 7,000 cells. The heated Glycol is cooled down by passing through a radiator, which is fitted at the front of the vehicle. Moreover, you can see how such a low height battery pack when fitted close to the ground level will lower the vehicle center of gravity. The lower of gravity improves the stability of the car considerably. The large battery pack is also spread across the floor offering structural rigidity against side collisions. Now let’s get back to Tesla’s drivetrain. The power produced by the motor is transferred to the drive wheels via a gearbox. As previously discussed, Tesla models use a simple single speed transmission because the motor is efficient in a wide range of operating conditions. You can see that the output speed from the motor is reduced in two steps. Even achieving the reverse gear is quite comfortable in an electric car. Just change the order of the power phase for this. The only purpose of electric car transmission is speed reduction and associated torque multiplication. The second component in the Gearbox is a differential. The reduced speed drive is passed to it. You can see this is a simple open differential. However, open differentials, have a problem of traction control. Why does such an advanced car use an open differential rather than a limited slip differential? The answer is that the open differential is more rugged and can carry more torque. A problem that occurs in an open differential can effectively be overcome with the help of two methods. Selective braking and cutting the power supply. In an Internal combustion engine, this power supply cut by reducing the fuel is not so responsive. However, the power supply cut is quite responsive and an effective means for obtaining traction control in an induction motor. This can all be accomplished using a state-of-the-art algorithm with help from sensors and controllers in Tesla. In short, Tesla motors has replaced a complex mechanical hardware system with smart, responsive software. Did you know an electric car could be driven efficiently with the help of just one pedal? This is due to its powerful regenerative braking system. That means saving the huge kinetic energy of the car in the form of electricity without wasting it as heat. In an electric vehicle, as soon as you release the accelerator pedal, the regenerative braking comes into action. The exciting thing is that during the regenerative braking the same induction motor acts as a generator. Here the wheels drive the rotor of the induction motor. We know in an induction motor the rotor speed is less than the RMF speed. To convert the motor to a generator. You just have to make sure that the rotor speed is greater than the RMF speed. The inverter plays a crucial role here in adjusting the input power frequency and keeping the RMF speed below the rotor speed. This will generate electricity in the stator coils, which is way higher than the supplied electricity. The generated electricity can then be stored in the battery pack after the conversion. An opposing electromagnetic force acts on the rotor during this process so the drive wheels and the car will slow down. This way vehicle speed can be accurately controlled during the drive using a single pedal. The brake pedal can be applied for a complete stop. As you might already be aware, electric cars are much safer than internal combustion cars. The cost of maintaining and driving an electric car is much lower than that of an IC engine car. With the drawbacks of the electric car evaded through the advent of improved technology, electric cars promise to be the cars of the future. We believe this article on how electric car works was useful. Please share this article in social media to motivate our team. If you have any doubt, please feel free to drop is down below.